Mussolini's death: On April 27, 1945, as Allied forces closed in on Milan, Italian dictator Benito Mussolini was captured by Italian Partisans. He was trying to flee Italy to Switzerland and was traveling with a German anti-aircraft battalion. 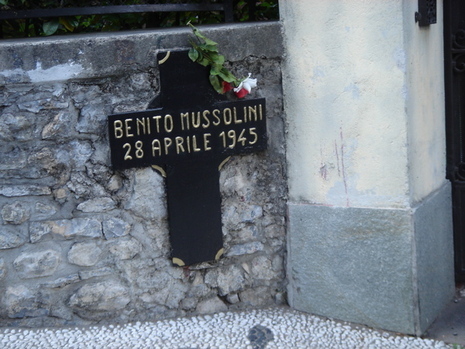 On April 28, Mussolini was executed in Giulino di Mezzegra; the other Fascists captured with him were taken to Dongo and executed. The bodies were then taken to Milan and hung for public display in one of the main squares of the city. On April 29, Rodolfo Graziani surrendered all Fascist Italian armed forces at Caserta. This included Army Group Liguria. Graziani was the Minister of Defense for Mussolini's Italian Social Republic puppet state. After the Allied occupation of southern Italy (1943), the King ordered Mussolini to be arrested in order to sign the armistice. Imprisoned, then liberated by the Germans, Mussolini lived in northern Italy until his capture and execution, on April 28, 1945, along with his mistress, Claretta Petacci, by military forces of the Italian Resistance. 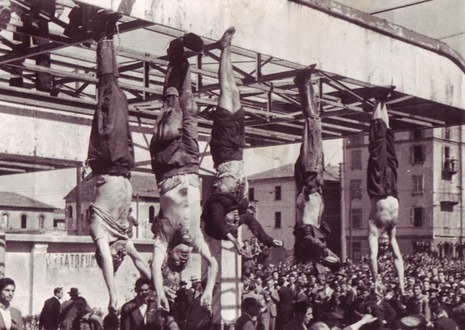 Next day, their corpses and those of Mussolini's henchmen were hanged in the Piazzale Loreto, Milan, on public view.